Now this was a fascinating assignment to photograph for a number of reasons. First - I do have to admit that I love a maze. There are some spectacular ones I've come across in England and in France so the prospect of watching one being created was quite exciting. Second - I learned something while I was shooting it, having spent quite some time talking to Adrian, the farm manager about modern farming techniques. So read on! This maze was created as a public attraction at Apley Farm Shop in Shifnal, Shropshire. 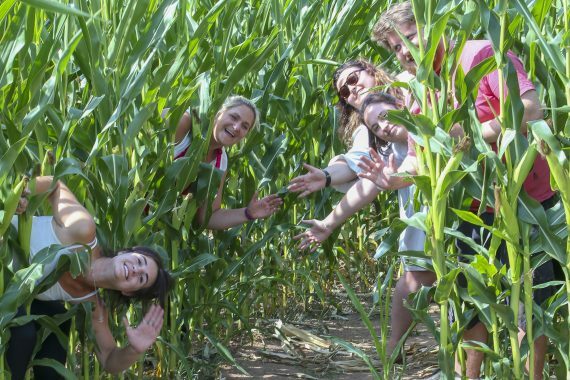 It covers an area of six acres, making it significantly bigger than the traditional hedge mazes. The planting took place in May - planning was very detailed during the early spring with designs and marketing approaches but the weather got in the way. Getting ready to start - yes yes I know you can see my shadow there! Due to the unseasonably wet spring in the UK and the very late end of winter (we'd experienced heavy snowfall courtesy of "the beast from the east" just a few weeks before) earlier planting would have meant the maize seeds would be waterlogged and wouldn't germinate. 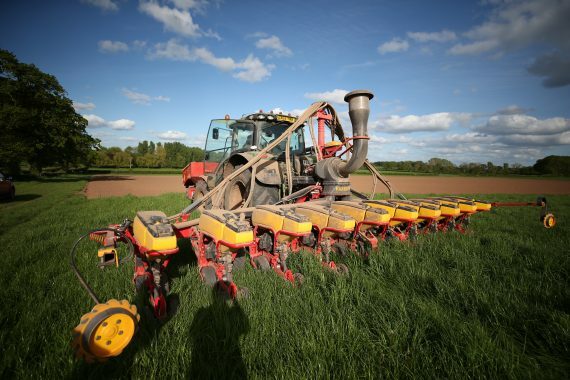 With a relatively short summer season to attract customers there's not an option to plant it again so waiting for the right time was absolutely key. Based on the crest on the coat of arms of the Hamilton family who own the estate, the design was mapped as GPS coordinates and the field was precisely ploughed ready for sowing. To drop the seeds according to the GPS coordinates the tractor is fitted with a computer which controls the seed hoppers (twelve of them) - effectively sucking a seed from the hopper and ejecting it in a precise location, working across the X axis of the field first and then the Y axis. As you can imagine precision is absolutely vital (as is a good GPS signal). I didn't realise just how much of a part technology now plays in agriculture - GPS is very common nowadays though for precision farming. While we were waiting for the tractor to arrive, Adrian and I talked about how the future might look for farming with automation - we already have trials of driverless cars and there's a logical progression to driverless tractors, potentially reducing the need for manual intervention, increasing the ability to have smaller tractors and ultimately reducing the cost overhead in what is a very tight margin business. We have the Harper Adams agricultural university nearby and apparently they're already researching and running trials in this area.